BCDB Rating: "The Book Of Power" has not yet received enough votes to be rated. This page has been viewed 11 times this month, and 674 times total. Cartoon Characters: Matt Trakker, Bruce Sato, Dusty Hayes, Hondo MacLean, Boris Bushkin, Bruno Shepherd, Max Mayhem, Nash Gorey, Buddy "Clutch" Hawkes, Ace Riker, Sly Rax, Duane Kennedy, Alex Sector, Floyd Malloy, Miles Mayhem, Jacques Lefleur, Nevada Rushmore, T-BOB, Calhoun Burns, Brad Turner, Julio Lopez, Gloria Baker, Vanessa Warfield, MASK Computer, Scott Trakker, Lester Sludge, Ali Bombay. Voice Actors: Doug Stone, Mark Halloran, Brendan McKane, Graeme McKenna, Sharon Noble, Brennan Thicke, Brian George. Directed By Bruno Bianchi, Bernard Deyriès, Tricia Piascik. Produced By Susan Cavan, Jean Chalopin, Andy Heyward, Tetsuo Katayama, Diana Dru Botsford, Mitsuya Fujimoto. Music: Shuki Levy, Haim Saban. Editor: Toshio Henmi, Eiko Nishide, Dan Sexton. First Aired on October 02, 1985. V.E.N.O.M. steals an ancient book which holds the secrets of a mythological city of riches. 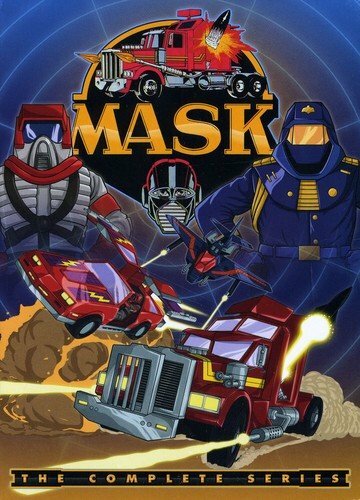 Alternate Series Titles: "MASK" and "Mobile Armored Strike Kommand." You can watch this episode today on your computer. Just click below to start viewing "The Book Of Power" online now. Do you have anything to add to this page? Have we made any mistakes... or do you have any additional information about The Book Of Power? If so, we would love to hear from you. Please send us a quick note with your additions or corrections to this page, and we will make the corrections as soon as possible! Do you love The Book Of Power, or do you think it is the worst cartoon ever? Let us know what you think! Surely you have an opinion... so share what you think. Take a minute and post your own comments about this cartoon here. The Book Of Power by Big Cartoon DataBase is licensed under a Creative Commons Attribution-NonCommercial-ShareAlike 4.0 International License.